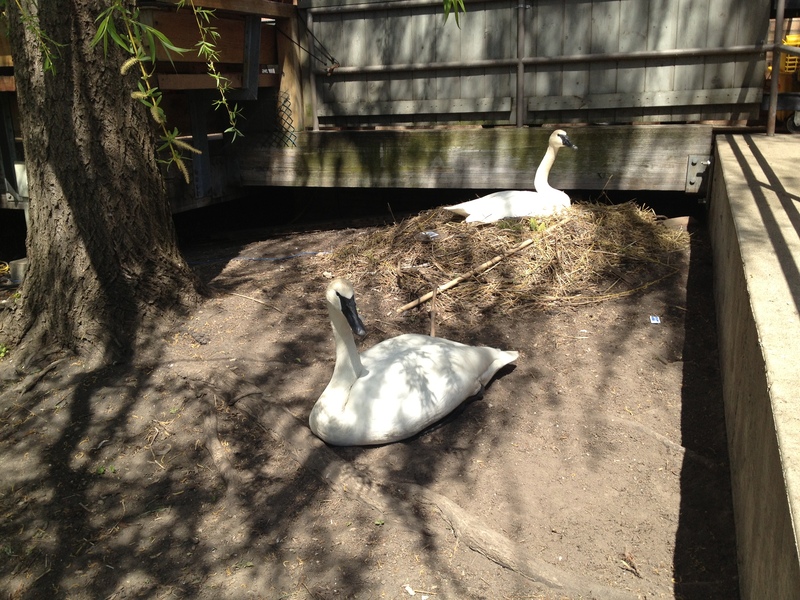 In early June, the Garden’s resident pair of adult trumpeter swans (Cygnus buccinator) gave birth to two offspring, called cygnets, in their nest near the Visitor Center. Much to the delight of Garden visitors, over the ensuing months the proud parents have enjoyed showing off their family as they paddle about the Garden Lakes. A little background on trumpeter swans: the trumpeter swan is North America’s largest waterfowl, with a wingspan of more than 7 feet. Famed for their French-horn call and immortalized by author E.B. White’s The Trumpet of the Swan, by the late 1800s the swans were nearly hunted to extinction in much of the United States and Canada for their meat, feathers, down, and quills. By the 1930s, just 69 trumpeter swans were known to exist in the continental United States. But thanks to the ambitious conservation efforts in our region and beyond that began in the 1980s, trumpeter swan populations are making an incredible recovery. The Garden’s two adult trumpeters are flightless, so cygnets born here at the Garden aren’t able to learn important skills. For quite a few years, the Garden has been a partner with the Iowa Department of Natural Resources’ Trumpeter Swan Restoration Program. More than a dozen cygnets born at the Garden have been brought to Iowa, where they’re assimilated with wild populations of trumpeters. 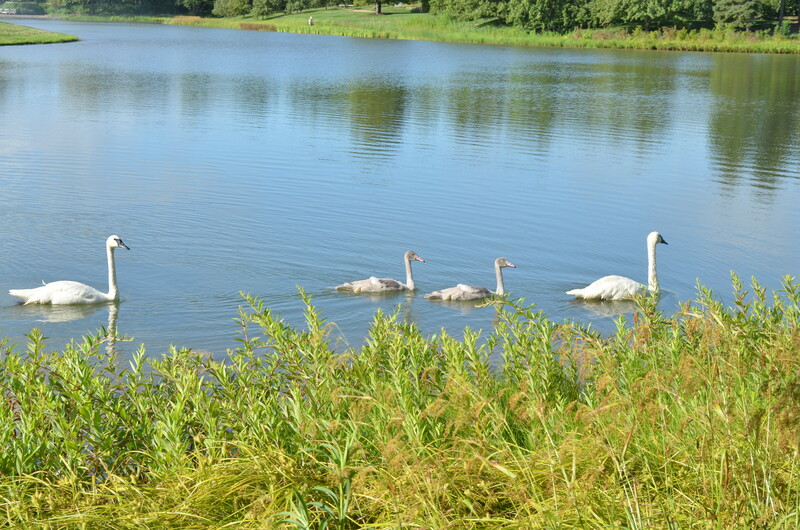 Just last week, our two cygnets (together with five born at the Lincoln Park Zoo this spring) were transported to Iowa, where they’ll be kept in a safe area over the winter. Come next spring, they’ll be able to interact with wild populations and begin the journey of becoming proud parents themselves one day. While it may be with some sadness that we bade farewell to our cygnets, we can take comfort knowing that they are helping to bring renewed hope for a species that, until recently, seemed headed for extinction. Interested in learning more about trumpeter swans? Check out The Trumpeter Swan Society, and read more about the successful restoration programs in Iowa, Minnesota, and Wisconsin. Previous Previous post: Fall Migration is Here!